1 The human heart, like that of all mammals, has two atria and two ventricles. Blood enters the heart by the atria and leaves from the ventricles. A septum separates the right side of the heart, which contains deoxygenated blood, from the left side, which contains oxygenated blood. artery) prevent back flow of blood into the heart, and atrioventricular valves prevent backflow of blood from ventricles into the atria. 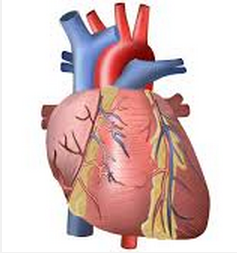 3 The heart is made of cardiac muscle and is myogenic (the muscle is self-stimulating). 5 Both sides of the heart contract and relax at the same time. Th e contraction phase is called systole, and the relaxation phase is diastole. One complete cycle of contraction and relaxation is known as the cardiac cycle. 1 Which of the following describes the mammalian circulation? 2 The diagram shows a vertical section through a human heart. Which row identifies the blood vessels W, X, Y and Z? 3 Which row describes the aorta? 4 The diagrams are vertical sections through the human heart. Which pair of arrows shows blood flow through the heart? 5 The right ventricle has much less muscle in its wall than the left ventricle. 1 The right ventricle develops a much smaller pressure than the left ventricle. 2 The right ventricle delivers a smaller volume of blood than the left ventricle. 3 Blood from the right ventricle travels less far than blood from the left ventricle. 6 What are the positions of the valves on the left side of the heart when the pressure in the left ventricle is higher than the pressures in the left atrium and aorta? 7 Which of the following statements is not correct? A Atrial muscles are connected to the ventricle muscles, except at the atrioventricular node (AVN). B Both atria contract at the same time. C Both ventricles contract at the same time. D Contraction of the atria is complete before contraction of the ventricles begins. 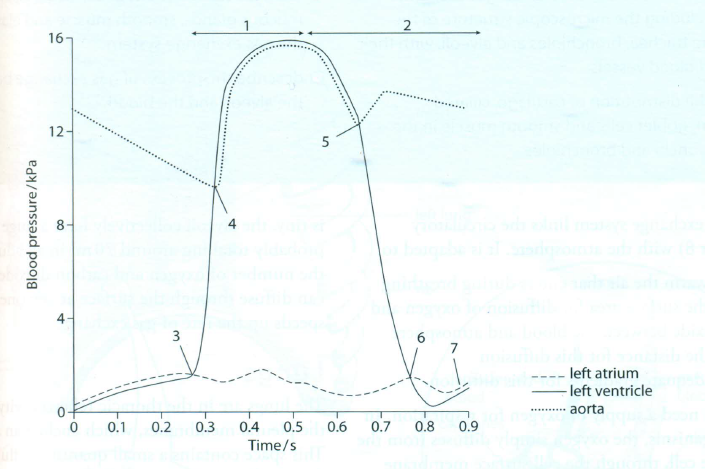 8 Which is the correct sequence of events in a cardiac cycle, beginning with its initiation by the pacemaker? 1 A wave of electrical activity passes along Purkyne tissue. 2 A wave of electrical activity reaches the atrioventricular node (AVN). 3 A wave of electrical activity spreads from the sinoatrial node (SAN) across the atria. 4 Cardiac muscle of the walls of the atria contracts. 5 Cardiac muscle of the walls of the ventricles contracts. 9 When a heart is removed from a mammal and kept in well-oxygenated buffer solution at 37°C, it continues to beat rhythmically. What may be concluded about the heart from this observation? A It has an in-built mechanism for initiating contractions. B It needs a blood supply to be able to contract. C It needs a stimulus from a nerve to be able to contract. D It needs a stimulus from a hormone to be able to contract. 10 The volume of blood pumped by the heart in a given period of time is called the cardiac output. It is calculated from the volume of blood pumped by one contraction of the heart (stroke volume) and the number of times the heart contracts per minute (heart rate). The cardiac output of a heart beating at 75 beats per minute was calculated to be 6.0dm3 per minute. What was the stroke volume of the heart? 1 Where is the mammalian heart beat initiated? 2 What causes the bicuspid valve to close during ventricular systole? 3 Figure below shows the pressure changes in the left atrium, left ventricle and aorta throughout two cardiac cycles. Make a copy of this diagram. a i How long does one heart beat (one cardiac cycle) last? 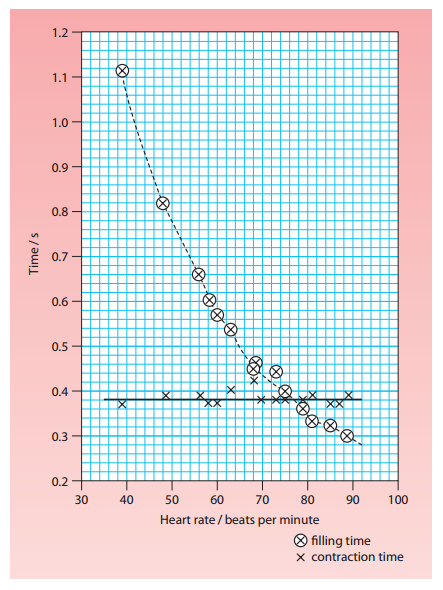 ii What is the heart rate represented on this graph, in beats per minute? ii the time when the ventricle is relaxing (ventricular diastole). ii the time when the atrium is relaxing (atrial diastole). d The atrioventricular valves open when the pressure of the blood in the atria is greater than that in the ventricles. They snap shut when the pressure of the blood in the ventricles is greater than that in the atria. On your diagram,mark the point at which these valves will open and close. 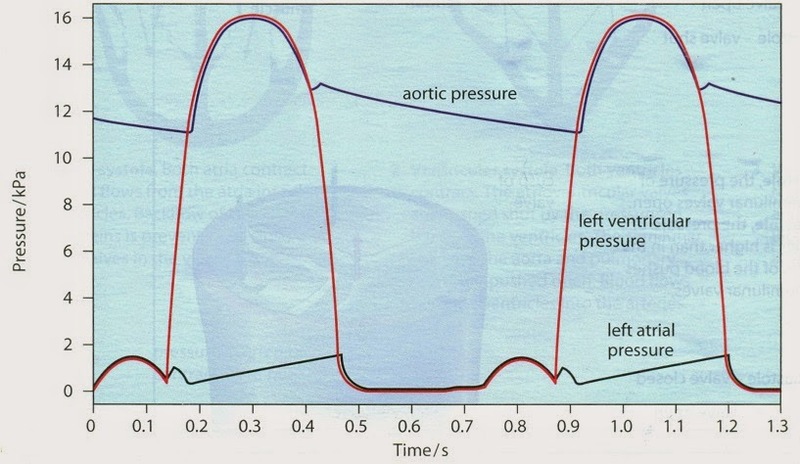 e The opening and closing of the semilunar valves in the aorta depends in a similar way on the relative pressures inthe aorta and ventricles. On your diagram, mark the point at which these valves will open and close. f The right ventricle has much less muscle in its walls than the left ventricle, and only develops about one-quarter of the pressure developed on the left side of the heart. On your diagram, draw a line to represent the probablepressure inside the right ventricle over the 1.3 seconds shown. a Calculatethe heart rate in beats per minute. b Thetime interval between Q and T is called the contraction time. i Suggest why it is given this name. ii Calculate the contraction time from this ECG. c The time interval between T and Q is called the filling time. ii Calculate the filling time from this ECG. d An adult male recorded his ECG at different heart rates. The contraction time and filling time were calculated from the ECGs. The results are shown in the table. i Suggest how the man could have increased his heart rate for the purposes of the experiment. ii Present these results as a line graph, drawing both curves on the same pair of axes. iii Comment on these results. 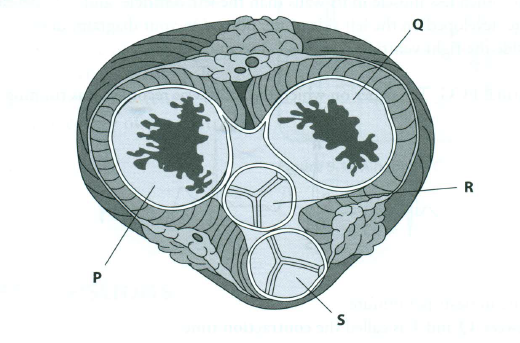 5 The figure below shows a cross-section of the heart at the level of the valves. a i Copy and complete the following flow chart to show the pathway of blood through the heart. 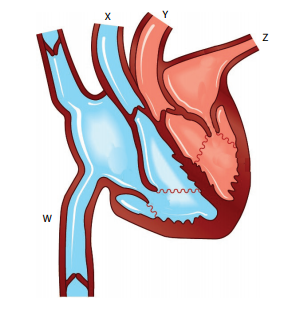 ii Explain how the valves P and Q ensure one-way flow of blood through the heart. The cardiac cycle describes the events that occur during one heart beat. 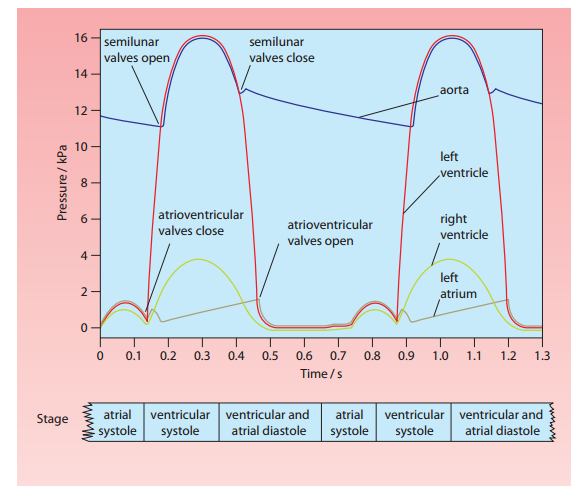 The following figure shows the changes in pressure that occur within the left atrium, left ventricle and aorta during one heart beat. Copy and complete the table below. Match up each event during the cardiac cycle with an appropriate number from 1 to 7 on the figure. You should put only one number in each box. You may use each number once, more than once or not at all. The firstanswer has been completed for you. For b, c, d, e and f, see figure below. so 20 mm represents 20÷25 seconds = 0.8 seconds. If one beat lasts 0.8 seconds, then in 1 second there are 1÷0.8 beats so in 1 minute there are 60÷0.8 = 75 beats. A quicker way of working this out is to subtract the answer to b ii from 0.8 seconds. iii As heart rate increases, contraction time remains constant, but fi lling time decreases. ventricular contractions, rather than by a faster ventricular contraction. providing extra oxygen to exercising muscles. advantage would be lost, as less blood would probably be forced out by each contraction. per unit time is increased. 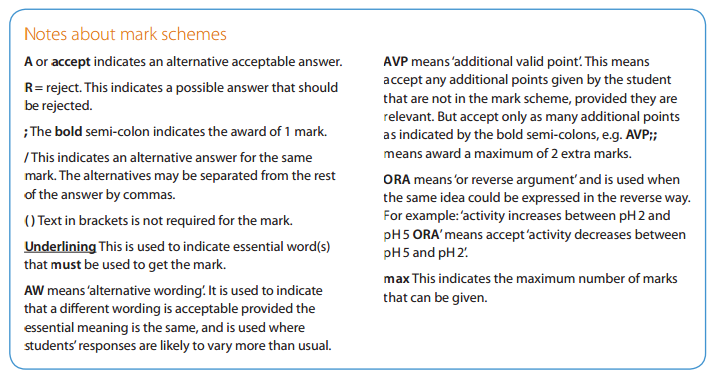 I think you transposed questions 3 and 4's diagrams! Ooops! Thanks. Your help is greatly appreciated. You have done an amazing job with this website! Thank you very much for all of this info!